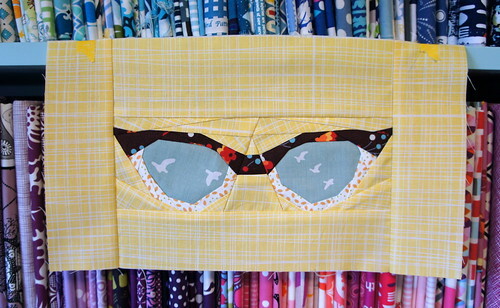 A couple of weeks ago I made this fabulous paper pieced block designed by Penny (Sewtakeahike) and Kerry (verykerryberry) of the design team Sew-ichigo. And can I just say that this is awesome?! Because it is. I’ve loved this pattern from the moment Kerry started posting sneak peaks of her version on Instagram earlier this summer. Kerry did birds reflected on her glasses in her original version and I’m no fool. I’m not going to mess with a fabulous design idea when it’s already in place. I used a great bird fabric that I love and already own by Birch fabrics. 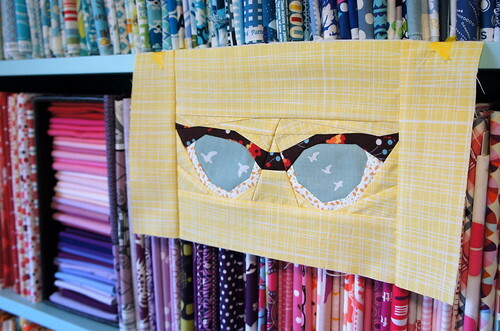 Other fabrics in this are the yellow cross hatch from a Riley Blake print (Farmstand? ), a brown flea market fancy print by DS, and a print from Sunkissed by Sweetwater. 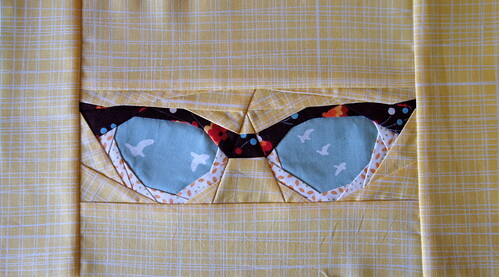 I love that I used four fabrics and they are four different manufacturers and yet they all work beautifully together. I don’t always take the time to paper piece. I like it but I don’t have the passion for it that I see some others do. But there is no denying that when you take your time and do it right, you can end up with something really fabulous. This pair of glasses is no exception. 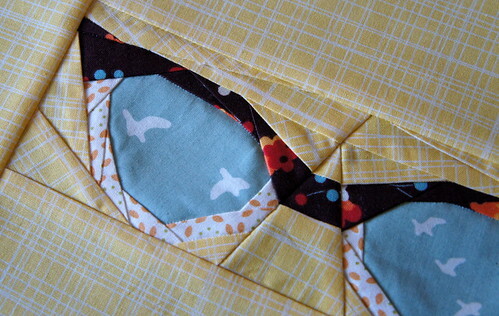 I love a beautifully pieced block and paper piecing gives you those perfect points that I’m always craving. This pattern is only rated a 2 out of 4 or 5 on the difficulty level…which is fine but that kind of scares me for what a 5 pattern would look like! lol I think I’m just fine tackling these “easy” patterns. A block like this will take me an entire evening to make (it would probably go faster if I set up a mini ironing board to be right next to my sewing machine). My original intent was to make this and use it on a sunglass case. And I still think that would be super cute, but I think that I would shrink the pattern down a bit for that. I made it at the standard size and that made the pieces reasonable to work with. Smaller would be harder. So now I’m hatching a longer term plan for this that involves a little project called a Weekender. No small goals around here! I love this pattern too, and yours turned out just adorable! Can't wait to see your Weekender!! Those glasses are completely awesome! I love the idea of integrating it into the Weekender. I've made the Harry Potter glasses that are paper pieced. Time consuming with all the little pieces, but, nice. oohh they are beautifully retro! Great fabric choices! i adore this pattern and your version is gorgeous! The glasses are just fantastic. Thank you! Penny and Kerry designed such a lovely pattern! That is adorable! I like the looks of paper piecing, too, but I also don't have a passion for it. In fact, when I do it I have guilt! It wastes so much fabric :(. I might have to suffer some guilt for the glasses, tho! You got me, Angela! I immediately recognized the glasses and thought I was reading one of Penny's blog posts. Wonderful use of the birdies. Thank you! I give all the credit to Kerry and Penny for such a fun pattern. It's always nice when the pattern lives up to your expectations though! So, so cute. I do recommend a mini ironing board just left of where you sew, makes life so much easier! This will be the perfect start to your weekender.